August 31 – Day 40 – Adrian’s birthday!! We had the day off for Adrian’s birthday today and spent it in what is really a lovely Mexican city. The further south we travel here in Mexico, the more we like it. The beaches are better, the cities more enjoyable and the people friendlier. There are also more street vendors.. so many, that it’s impossible to sit down anywhere without being approached, countless times. The main products for sale are belts or bracelets made from knotted embroidery thread, scarves, rugs, shirts, carvings or bookmarks. And it is constant. Mostly, if (or when) we say ‘no thanks’, the seller walks away. And then the next seller approaches us. And so on. After spending some time in enjoying a coffee on the square and people watching, we headed out to Monte Alban – the ruins of one of the earliest cities of mesoamerica. The city was founded around 500 BC and abandoned sometime between 500-750 AD. So it’s pretty old! 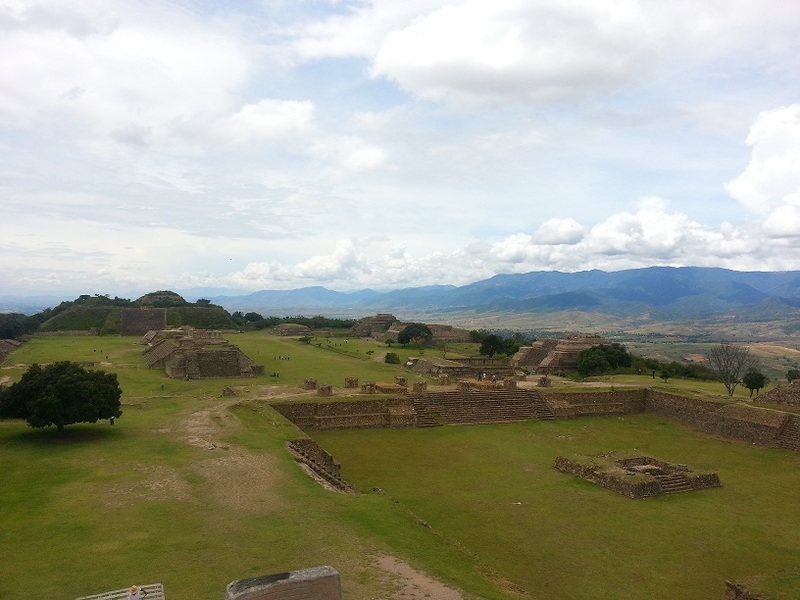 We had lovely weather and it was nice just walking around amongst the very expansive ruins… Monte Alban covers an area at least equal to the size 10 football fields – so there was lots of walking to be had! For Adrian’s birthday dinner, I’d found a fair trade, organic, slow food (ie all local produce) Mexican restaurant with a social responsibility program and its own single village Mezcal distillery. It was to be Adrian’s first Mezcal in Mexico this trip… and the waitress instructed him to sip it slowly throughout the meal. The slow sipping really brings home the flavour of the drink, apparently… a flavour Adrian described as an “acquired taste”… kind of like the chilli wine from the Kingston markets, I’d imagine!! My main meal involved a delicious sounding stuffed capsicum with a whole heap of different veggies and grains and a thick, dark sauce – minus the grasshoppers that this particular dish also usually came with. Except that three quarters of my way through the meal, I noticed a significant number of stringy, decidedly grasshopper-antenna-like, threads on my plate. Antenna, attached to what looked – to me – like a part of the grasshopper anatomy. All of a sudden I was hit with the realisation that I’d just eaten a plate of marinaded grasshoppers. I passed the plate over to Adrian for an inspection. His unsympathetic (and, it must be said, highly amused) view was that they were just strings from some of the vegetables… but to the best of my knowledge, and just like in Australia, neither Mexican capsicum, nor kidney beans, nor rice, nor mushrooms are fibrous. I guess the positive is that I’ve now ticked the ‘grasshopper’ box. Apparently, they’re a great source of protein…hmm.. This entry was posted in Mexico and tagged food, ruins. Bookmark the permalink. Does that mean you are no longer a vegetarian? Hmm no… still veggo… just occasionally an unintentional insect eater!